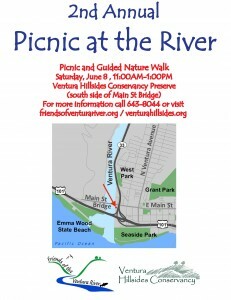 Friends of the Ventura River and Ventura Hillsides Conservancy will host a free community picnic and present information about the Ventura River Parkway on Saturday, June 8, 2013 from 11am-1pm. 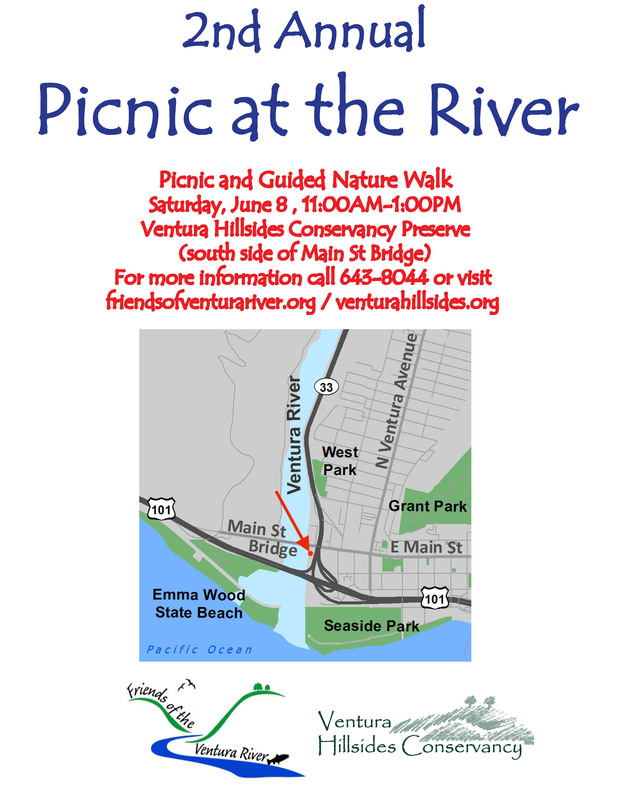 The event will be held on the Conservancy’s Willoughby Preserve in the Ventura River, south of the Main Street Bridge. The public is invited to take a self-guided tour to witness first-hand the progress made in restoring the property over the past year. Informational exhibits will be stationed at areas throughout the preserve extolling the various benefits of the parkway plan. The theme of the event is “reconnecting Ventura to the river in our backyard.” Visitors can take advantage of new trail connections between the Ventura River Trail and Emma Wood State Beach. A diverse coalition of partners has gathered under the Friends of the Ventura River umbrella including the State Coastal Conservancy, Trust for Public Land, California State Parks, National Parks Rivers, Trails & Conservation Assistance Program, Coastal Alliance United for a Sustainable Economy (CAUSE), Environmental Defense Center, Tortilla Flats Archive, Project Understanding, Downtown Ventura Organization, Ventura Chamber of Commerce, Ventura Visitors and Convention Bureau, Ventura Audubon, Ventura Water, the City of Ventura’s Community Development, Environmental Sustainability and Parks and Recreation departments, Ventura Surfrider, Santa Barbara Channel Keeper, Ventura Citizens for Hillsides Preservation, the Ojai Valley Land Conservancy and the Ventura Hillsides Conservancy. Parking is available in the Main Street Lot across from the Peking St. bus stop, with overflow available on Olive St, but as always please consider walking, biking, taking the bus or carpooling. Please join us to learn more about this exciting opportunity to reconnect with our river! For more information call Lee Sherman, Ventura Hillsides Conservancy Development & Volunteer Coordinator at 805-643-8044.